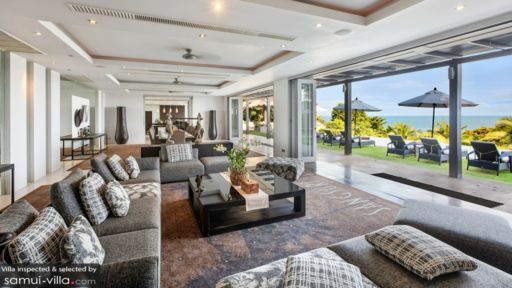 Part of the luxurious Sangsuri Estate in Chaweng, a major tourist destination in Samui, Sangsuri Villa 1 is the largest of the three villas with eight bedrooms and two dorms for children. 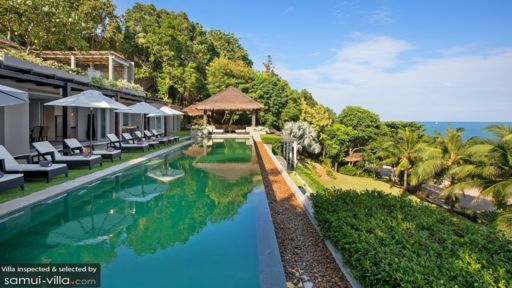 A complete ‘mini-hotel’ in its own special way, Sangsuri Villa 1 is the quintessential holiday destination for families and friends as it has direct access to the beach, a private pool, excellent amenities, and even a pavilion which is home to an AV room and yoga studio. What’s more the garden can be converted into your very own outdoor cinema to put the final touches on your dreamy tropical adventure! The ten bedrooms at Sangsuri Villa 1 are spread across the many levels with the master suite found on the ‘beach level’ steps away from the Jacuzzi. The bedroom is furnished with exceptional fittings and features a king bed. It has some enviable views and leads to the garden with the projector! The other bedrooms are well-furnished with king beds and are air-conditioned. They have en-suite bathrooms with proper fittings as well. The two dorms are well-suited for children, and they have their own en-suite bathrooms. The bedrooms have their own terraces and sun roofs for a great way to enjoy your natural surroundings. Sangsuri Villa 1 is a multi-storeyed villa which has several levels – beach level, pool level, arrival level, and others. 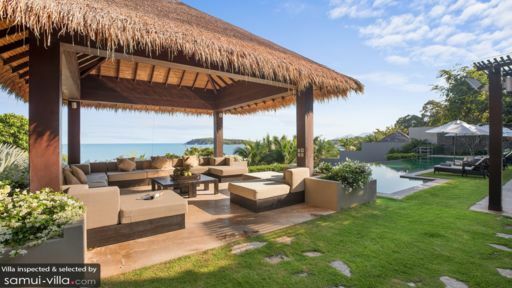 At the beach level, guests have the luxury of heading down directly to the soft, sandy beaches of Samui, where they will find sun chairs for lounging and can splash around in the water, sunbathe etc. There is a beach bar, spa sala, as well as a Jacuzzi for up to six guests. The pool level is where guests will have the chance to witness the 22-metre swimming pool with an infinity edge. Overlooking the sea, and the horizon, the gorgeous space has a pool deck with sun loungers, and a pool sala. Living areas at Sangsuri Villa 1 aren’t just one or two, each level has its own form of living space whether it be outdoors or indoors. On the pool level, you will find a large living and dining space where everyone can gather and enjoy the limitless time that can be spent enjoying the surroundings. The areas are comfortably furnished with plush couches, flat-screen TVs, DVD players and the likes. The garden level has a wall with a projector screen where guests can enjoy their private outdoor cinema. A separate two-storey pavilion is home to an AV room, yoga studio, and is perfect for relaxation. The dining areas are also found alfresco or indoors as per your preference. In case you wish to dine out under the stars, it can be arranged, so that friends and family can turn it into a garden party for making memories of a lifetime! There is a double kitchen is a resort-style affair with a lavish arrangement of appliances and amenities. A barbecue is available to guests along with a relaxation sala for a complete experience. Sangsuri Estate takes great care in providing the best of everything to their guests. The house-chef is there to look after all your meals, and if you wish you can request for in-house massages and spa treatments as well. Guests have the option of renting out the other two villas as well, if required for a bigger gathering. There is a gym on property and the estate also provides kayaks and paddleboards for guests to take. Chaweng in Samui is known for its famous restaurants and bars as well as the beaches. There is Choeng Mon beach in the vicinity apart from the beach directly accessible from the villa. The Choeng Mon beach Night Market is the place to be to get your fix of local food, finds, and things to do! Check out the Art Samui Museum, a 3D gallery with optical illusions to keep you busy!